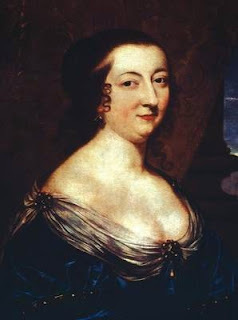 Catherine de Vivonne, the "Incomparable Arthénice"
Although she herself was not a writer, Madame de Rambouillet exerted a powerful influence over the development of French literature in the early-modern period. She was the central figure in establishing a literary salon that cultivated intellectual and artistic conversation, shaped a sophisticated literary language, and fostered the development of writers and thinkers. The writer Jean Regnault de Segrais would later write of her that she "corrected the wicked customs that went before her" and that she "taught politesse to all those of her time who visited her." Catherine de Vivonne was born in Rome in 1588 (the exact date is unknown). Her father, Jean de Vivonne, was a counselor to Henry III of France and an ambassador to Spain and to Rome. Three years before Catherine's birth, her father was granted the honorific military title of marshal of France (Henry III granted eight such titles between 1574 and 1589); in 1596, Jean de Vivonne was granted the title of marquis and the lordship of Pisani, in south-west France. When she was just twelve years old, Catherine de Vivonne was married to Charles d'Angennes, a member of the French court (he would later be the French ambassador to Italy and Spain), who would inherit the title of marquis of Rambouillet. Although Catherine de Vivonne and her husband were both intimates of the French court, by then the court of Henry IV and Marie de' Medici (indeed, Catherine de Vivonne took part in the coronation), she withdrew from the court and from participation in its ceremonies and entertainments, disgusted by its coarseness and the "brutality" of the king's behavior and appetites. At the former Hôtel Pisani, which she had restored in an Italian-inspired decorative scheme and renamed Hôtel de Rambouillet, she opened her home, and in particular her Chambre bleu (the Blue Room) as a refuge from the harsh realities of city and court. In her salon (though the word was not in use until later), social differences were put aside--in this world, intellectual merit, not rank or title, was what mattered. There men and women with royal blood mingled with writers, philosophers, and actors. Among those whom she gathered in her Blue Room and whom she influenced were women we have met before: la Grande Mademoiselle, Anne-Marie-Louise d’Orléans, duchesse de Montpensier; the novelist Madame de la Fayette; the writer Madame de Sévigné; and the novelist Madeleine de Scudéry. Catherine de Vivonne maintained her conversations at the Hôtel de Rambouillet until her death. There is no biography of Catherine de Vivonne, at least not in English, but you will find an extended discussion of her, along with many other women famous and not-so-famous for their literary salons, in Benedetta Craveri's The Age of Conversation.